To see our tasks well done. Our School we thus address. The school song "There stands our school by Mahim Bay, Built on this wondorous site" etc was written by Mr. Ramsay, Hostel suprintendant (there was a hostel attached to the school in those days) in 1956/57. The school shield represents the 'Cross of St Andrew , the patron saint of Scotland. The white 'crux decussata' (cross) quarters the shield into four segments, each representing a house colour denoted by the Fleur-de-lis, the Castle, the Lion and the Palm Tree. These are Latin words. They mean Perseverance and Faith in God . These are two qualities which personify the Scottish character. Scottish expects that every Scottishite will do his duty and endeavour to achieve success in life by means of honest and strenuous effort, putting full faith in God. 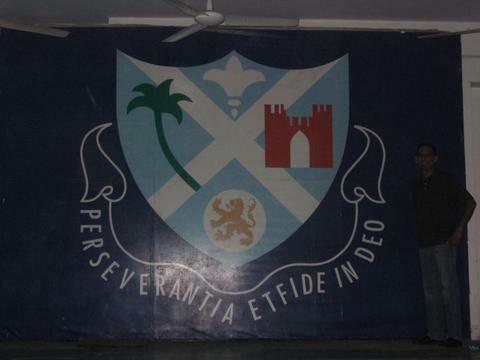 The school flage is sky-blue in colour. It bears the 'crux decussata' or the Cross of St.Andrew. Although never officially adopted, the St Andrews Saltire (cross) became the emblem of Scotland and has been flown for hundreds of years by the Scottish people. It was incorporated in the Union Jack that became the British National Flag after the Union of England and Scotland in 1707. St Andrew was a fisherman and the brother of St.Peter. He was a disciple of John the Baptist. He brougth to Jesus the boy from whose luch he produced enough to feed a crowd of 5000. Jesus made Andrew his first apostle and promised to make him a "fisher of men". This is an aerial shot of the school on Wikimapia. Pretty cool, you can even see the football field which used to be green when I was in school but is now without any grass. Guess they let go of Tommy.